Segura Educational Initiative, Maria Baquerizo (left). 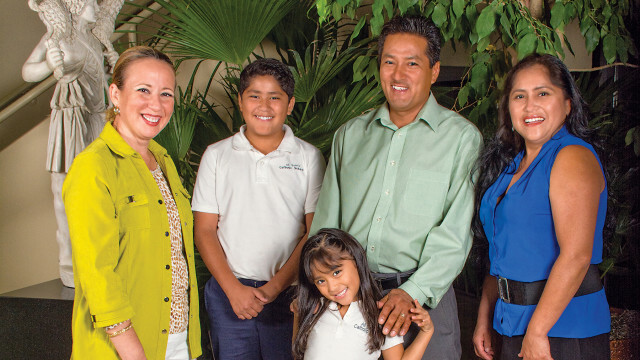 Julio Garcia and his wife, Maribel, wanted their three children to have a Catholic education, but knew they couldn’t afford the tuition for private school. Julio works in construction and his wife tends to the family at home. Parishioners at Sacred Heart Church in Richmond since moving to the city thirteen years ago, the couple believed a Catholic education would offer their children excellent academics, values that may not be taught in public schools, and an education in the Catholic faith, which was very important to the family. After talking with Maria Baquerizo, Segura director for the Catholic Diocese, the couple was able to find financial assistance through the Segura Educational Initiative for Children. The program was founded in 2010 after Bishop Francis Xavier DiLorenzo of Richmond recognized the need to help immigrant families regardless of their ability to afford tuition. To be eligible for tuition assistance, Latino families must be Catholic, have an annual income of at least $10,000, and apply for financial aid through FACTS Grant and Aid program. Tuition assistance is based on the family’s financial capability and the cost of tuition. 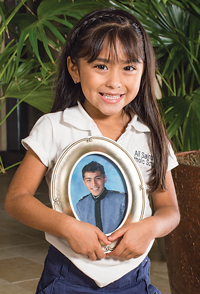 Abril holds a photo of her oldest brother, Julio Cesar, who wasn’t available for the family picture on the previous page. Many parents in the Richmond area like the Garcias would love to send their children to private school but have trouble meeting the requirements for tuition. That’s where a school’s financial aid and scholarship programs make a big difference. After qualifying for the Segura program in 2011, the Garcias enrolled their two sons in All Saints, Sacred Heart’s parish school. Today their oldest son, Julio Cesar, is in Benedictine College Preparatory through a scholarship he obtained after graduating from All Saints, and the youngest sibling, Abril has started kindergarten at All Saints. She attends with her brother Carlos who will be graduating this year. Typical families that apply for Segura have approximately three children and an average income of $30,000 a year. This year, the program is providing assistance to 300 students and more than a hundred families. Families usually find that the cost of a private education for one school year can range from $6,000 to upwards of $25,000, depending on the school and the grade level. This school year, St. Christopher’s is offering a total of $2.9 million in financial aid. “We always have more need than we can fully meet, but we work hard to make sure lots of families think about coming to St. Christopher’s,” he says. The school offers two merit-based Debbie Robson Merit Scholarships for rising ninth graders that pay 100 percent tuition for all four years of upper school at Steward, assuming the student maintains a certain criteria. The Catholic Diocese of Richmond oversees twenty-nine Catholic schools in the state, including ten in the greater Richmond area. “Two of the schools in the Richmond area – St. Gertrude High School and Benedictine College Preparatory – are run by religious orders, so they are not directly underneath the Diocese,” says Annette Parsons, chief administrator of the office of Catholic Education for the Diocese. The Diocese offers a significant number of need-based scholarships. Many are offered through the McMahon Parater Foundation, an endowment for Catholic schools. “We take the monies we receive and we distribute to the schools,” Parsons says. Both Catholic and non-Catholic students are eligible for the scholarships. Families must apply for financial support through FACTS Grant & Aid Assessment. “The amount of support is determined by the student’s calculated need,” Parsons says, noting the scholarships are for elementary through high school students. Scholarships are also provided through parish support for Catholic students. “Each school has its own funding packages with money it raised during the year to help with tuition,” Parsons says. scholarships for low-income new students at non-public schools. “It’s available to students who transfer in from public schools and from out of state,” Parsons says, noting that individual or business donors receive a 65 percent tax credit. The Diocese’s McMahon Parater Foundation for Education has been approved by the Virginia Department of Education to receive donations under this program and to distribute scholarships to qualifying students who attend one of the schools in the Diocese. Last year, the Diocese gave out $2.4 million in scholarships in the greater Richmond area and still had $3 million in need that couldn’t be met. In the last five years, the Diocese has been very intentional in its outreach to Latino families. “Many of them are operating well below the poverty level,” Parsons says. The Garcias are thrilled with Seguro and their children’s education track. “What we love about the education our children receive at All Saints is that the school helps with their spiritual formation, not just academics, but as whole individuals, fostering sensitivity towards others and service to others,” they said. Previous articleAre We Writing Off Cursive?